Transmission: May 1985 onwards and June 1987 onwards. Everyone loves a story. In fact, without stories, there would be no television and, more distressingly, no Curious British Telly. We'll allow you a moment to go and hurl some Courvoisier down your throat to calm you after that peep into hell. Back? Good, so, stories, yes, they're very important. Particularly if you want to keep children entertained and, first and foremost, quiet for a bit. It doesn't always have to be a packed full of gurning child actors with an inability to read lines though. Sometimes the simplicity of an adult telling a story to camera is all that's needed. You're probably thinking that we're going to rattle on now about Jackanory. Well, we're not as we never watched it. We were far too busy enjoying Tales from Fat Tulip's Garden. Tales from Fat Tulip's Garden saw Tony Robinson leaping, pouncing and strolling around a picturesque house and its gardens as he regaled the viewer with tales about Fat Tulip. A rather slow and dimwitted chap, Fat Tulip had his heart in the right place and would find himself on rather gentle tales such as getting frisbees down from trees, coping with a tortoise burrowing under his house and finding a missing key. Fat Tulip is joined on his adventures by his friend Thin Tim, the policeman Inspector Challenor and garden frogs Ernie and Sylv. It all sounds a rather placid affair, but the stories are driven with gusto by Tony Robinson who plays all the characters and semi-improvises the curious tales. 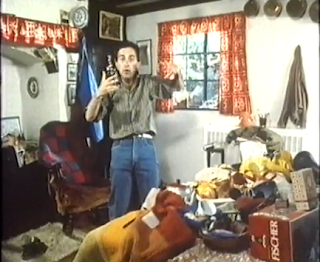 1985 was the year that Tales from Fat Tulip's Garden hit ITV's screens in a 4pm slot as part of CITV. The initial idea for the show came from characters that producer Debbie Gates' daughter had dreamt up - Fat Tulip literally being an obese tulip. Tony Robinson was inspired by these characters and also the lack of imaginative storytelling for children on our screens. Something different and a little surreal was required, so he got writing. The beautiful house featured in the series was known as Little Monkhams and was a residence in Woodford, London. 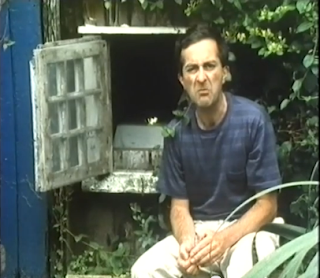 In a deliciously delightful revelation, it turned out that the house chosen for the series was one that Tony Robinson had played in as a child. Other scenes were filmed in Epping Forest which faced Little Monkhams. Sadly, Little Monkhams is no more after being destroyed in a fire in 2007. It was up for sale, at the time, for a cool £750,000. For a rather dedicated look at the ruins of Little Monkhams, check out the links section below. Thirteen tales were produced by Central Television, but this was not the end of Fat Tulip and his odd adventures. Tales from Fat Tulip's Garden had proven popular with viewers and a repeat run followed in 1986. The success of this repeat run led to the commissioning of Fat Tulip Too, another 13 episode run. Fat Tulip Too differed from the original series as it saw Fat Tulip and his friends venturing out of Little Monkhams into exotic locations such as Leyton Swimming Baths. In between the two series there was a Christmas special. Sadly, the one run of Fat Tulip Too was the last that viewers would see of the series. A VHS of Tales from Fat Tulip's Garden was released at some point, but details on this release are scant. Speaking many years later, Tony Robinson spoke about the show's demise, "The reason was, apparently, that children's television needed to make money, and the way it was able to make money was by secondary marketing of the images around the television programmes. Given that we worked in the imagination and all the images of these various characters were actually in the listener's head - that was the whole point of it - it was no longer particularly financially interesting to ITV.". There were two books based upon the series which were released in 1985, but obviously made little financial impact given Robinson's comments. Thankfully, some bright spark decided that both series deserved a DVD release and all 27 episodes are now available as a 2-disc set. Airing in our preschool days, Tales From Fat Tulip's Garden was something we watched way back, but the memories were fuzzy. We clearly remember watching it back in 1986 or 87 one afternoon at our cousin's house and it's hard to believe that was nearly three decades ago. The main things embedded in our memory were the big house and Tony Robinson's empassioned storytelling. Rewatching shows from our youth gets us particularly excited, so shining the spotlight on Fat Tulip and his friends was a no-brainer. The show IS Tony Robinson. He brings so many facets to the table as a performer and a storyteller. The silly voices, the facial expressions and the seamless ability to go from manic to sedate in the blink of an eye mean you need nothing more than him on screen. If you read the scripts to the stories, you'd think little of them. They have a simple charm, but Tony Robinson creates a busy world packed full of strange characters. Securing Little Monkhams was a good coup as it provides a calm, tranquil setting which juxtaposes nicely against the surreal adventures. Quite how Fat Tulip could afford it we're not sure as he seems more council flat than centuries old detatched house. We think that Fat Tulip Too lost a little of the series' charm by leaving Little Monkhams behind. Taking it out of this timeless world also has the effect of dating the show slightly which is a shame and takes away some of the magic. It would be interesting to find out quite what prompted this move as it would surely have kept costs down by sticking to one location. Although Tales from Fat Tulip's Garden didn't have a projected lifespan akin to that of Jackanory, we feel it probably had a couple more series in it. Even if ITV didn't find it that commercial a venture, there was surely room for repeat runs in their lunchtime slots. Sadly, we will never understand the commissioning process for television channels. We imagine it's complicated with lots of forms to fill in and we'd rather be down the BFI Archive. 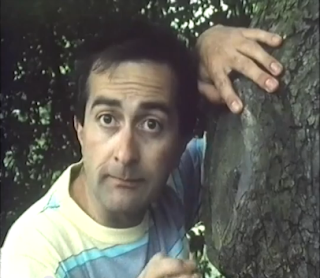 A similar format featuring Tony Robinson arose in 1991 entitled Blood and Honey which saw Old Testament stories being retold with a slightly less biblical feel. For us, it lacked the charm of Fat Tulip's Garden and, also, we're absolute heathens. In conclusion, we were glad we took the opportunity to catch up with Tales from Fat Tulip's Garden. It's easy to forget that Tony Robinson has had a career outside of Blackadder and Time Team, but Fat Tulip's is a good showcase of his skills as a performer. We really like the patchwork quilt effect of the atmosphere - it veers from manic, to mundane to surreal - and this is what marks it out from other similar shows. We were surprised that it got a DVD release as it's not the most well remembered children's show of the 80s, so ITV need to be given credit for that. Revisiting the show was well worth it and we recommend you take the time to familiarise yourself with it. Was it nearly 30 years ago?!! It's funny that of all the programmes I have composed music for, Fat Tulip is still the main programme people ask me about! I have noticed recently that a DVD of the TV series has been released too! Debbie Gates the producer and creator of Fat Tulip's Garden, was passionate about producing imaginative programmes for children's television in a storytelling format. So with co-writer Tony Robinson, the concept of Fat Tulip's Garden was born. Debbie and director Jeremy McCracken, wanted the music and graphics to reflect an edge to the series, so I created many squelchy and unusual sampling effects. These ended up in the main theme music and were also used for various character stings. Because you never visually saw the characters in each story, Tony (the narrator) had to describe and act out each character to camera. The musical stings for each character also played an important part to conjure up an image in the imaginations of the children watching it. I remember having great fun working with the production team. It was a marvellous creative time! I fondly remember the post-production team with film editor Peter Spenceley, being in stitches when I took in my strange musical compositions to represent each of Fat Tulip's characters! I continued working with Debbie Gates when she went on to produce the next series - Fat Tulip Too. She also produced and co-wrote Revolting Animals, Jellyneck, and Gumtree - all with the same unique storytelling concept and quirky music by myself.